It’s just past 10am on a late September morning -- one of those bright, clear early autumn days when the light seems more crystalline than usual, making shadows deeper and colors bolder. From where I’m standing, this quality of the light couldn’t be any more obvious: I’m on the roof of a 12-story building on the Brooklyn waterfront, with what seems like all of New York City laid out below me. Sunlight glints off of the East River, off the spans of the Williamsburg, Manhattan, and Brooklyn Bridges -- and off of the cherry-red peppers growing at my feet. 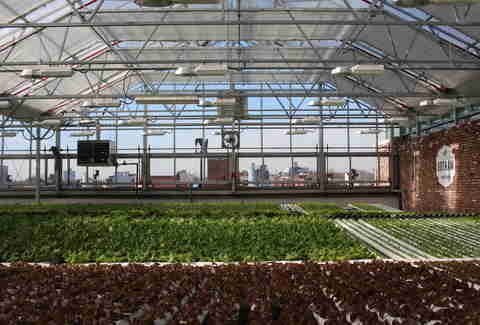 This is the Brooklyn Grange, a green oasis perched high above the hustle and bustle of the city streets below. Each season, this Brooklyn Navy Yard location as well as the original Grange in Long Island City, Queens, together produce more than 50,000lbs of fresh vegetables and herbs out of just 2.5 tiny acres of space. 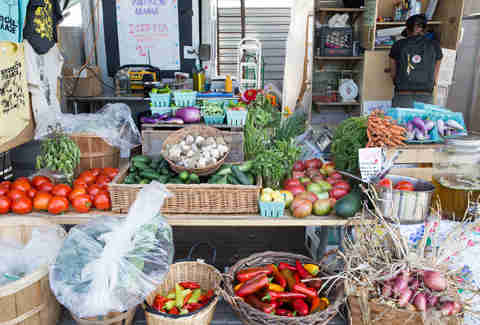 Customers can find this ultra-ultra-local fare at two weekly farmers markets as well as area-favorite restaurants like Prospect Heights’ James and Williamsburg’s Egg, with whom the Grange maintains wholesale accounts, or through the farm’s seasonal Community Supported Agriculture (CSA) shares. Plakias is leading me on a tour of the farm, guiding me through the leafy green kale, colorfully stemmed rainbow chard, fragrant mint and oregano, and crisp salad greens (not to mention the coop containing a handful of chickens: Chicki Minaj, Birdie Sanders, and Chickira, among others, given their cheeky monikers by young participants in the Grange's sister non-profit City Growers). And though it’s still early on a weekday, we’re not alone: a few of the Grange’s farmers are busy with the morning’s harvest, while a staff member shepherds one of the farm’s weekly ticketed tours around the roof. While many of the hipsters, tourists, and hipster-tourists making up the group head towards the building’s edge to take panoramic photos of the city skyline, plenty of them also snap selfies with the farm’s giant, now-fading sunflowers, or zoom in on closeups of kaleidoscopic aji dulce peppers. Brooklyn Grange is just one example of a growing urban agriculture movement in New York City: In 2016, interest in farming within city limits -- both on the part of growers and of eaters -- is at an all-time high. Dozens of farms operate throughout the city -- from East New York to the South Bronx -- both on the ground and high up on rooftops. Over the past decade, both cooks and diners' deep interest in fresh, local food has translated into a blown-out farm-to-table movement where 'farm-to-table' essentially lost all meaning. That's not the case here. Urban farming in NYC isn't a result of some trend that jumped the shark, this truly is farm to table. And while farming in the city presents its own set of unique challenges -- including a lack of space and institutional support -- the farmers I spoke with see the future of urban farming as a bright one, a way to provide farmers with viable employment and eaters with healthy food even as the society-wide trend towards urbanization continues. Gotham Greens, founded in Brooklyn in 2009, is perhaps one of New York’s best examples of the integration of farming with everyday city life. Its four rooftop greenhouses -- three in New York and one in Chicago -- use 100% soil-free, hydroponic technology to produce nearly 2 million pounds of leafy greens, herbs, and tomatoes each year. Its flagship greenhouse was built in Greenpoint in 2011, but it’s Gotham’s second Brooklyn location that’s undoubtedly the more well-known of the two. Built over the sparkling new Whole Foods location in Gowanus in 2013, the greenhouse measures more than 20,000sqft and and is the first-ever example of a commercial greenhouse to be fully integrated into a supermarket. 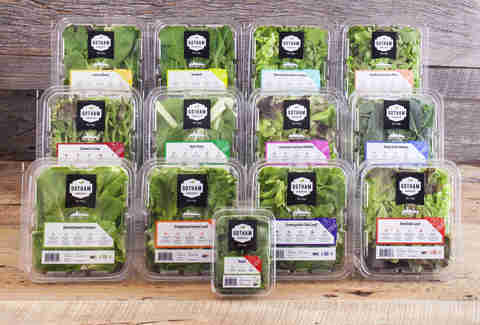 New Yorkers love their Whole Foods and, in Gowanus, shoppers can not only pick up their cherished Greek yogurt, salted almond butter, and pita chips, but also peppery arugula, musky basil, and crunchy bok choy that travels all of a few floors down from the greenhouse. Shoppers who don’t live near a Whole Foods -- or don’t have the budget to shop at one -- can head to their local ShopRite, Target, Key Food, and Foodtown supermarkets, all of which Gotham Greens supplies. Baum says it’s important to the company that a wide demographic is able to enjoy their produce, not just the Whole Foods set. While increasing access to local, tasty food is of paramount importance to all of the city’s urban farms, their missions go far beyond that. In order to survive and thrive, city farms have to make the best use of New York’s physical spaces, which are forever at the whims of, among other forces, the real-estate market, political wranglings, and the ebb and flow of gentrification. 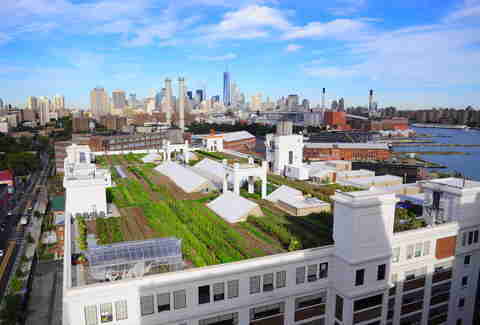 A huge part of the urban farming movement in the city has been the reclamation of underutilized or abandoned spaces: that reclamation process, in fact, is part of the reason why so many NYC farms are on rooftops, as opposed to on the ground. While an empty rooftop is simply a waste of space as well as of the hot city sun’s rays, a green rooftop -- especially one that produces food -- takes advantage of one kind of space the crowded city has in spades. Big cities like New York tend to run on a different clock than most other places in the country, with many workdays starting around a leisurely 10am, making it easy to stay out late and take advantage of all the things the city has to offer. But, just like their rural counterparts, urban farmers don’t have the luxury of sleeping in in the morning. As Plakias explains, city farmers see their fair share of sunrises. “During peak season, our farmers often get to work at sunrise,” she says. Just like on country farms, the Grange’s produce is highly sensitive to the sun’s hot rays, and much of it needs to be harvested and ready to go by mid-morning, before NYC’s generally insane summer temperatures reach their daily highs. As Plakias notes, the farm’s super-popular baby salad greens -- of which the Grange farmers typically harvest up to 200lbs per day on twice-weekly intensive wholesale harvest days during peak season -- are especially sensitive to the heat. The Grange is a commercial farm, and employs four full-time, year-round salaried farmers, plus a seasonal crew of about 12 part-timers who work from late March to late October. Each Saturday during growing season, the Queens farms hosts an open house during which members of the public can come get their hands dirty alongside the farmers, but, as Plakias explains, volunteer work isn’t a substantive part of what the Grange does. At Gotham Greens in Gowanus, early mornings are the name of the game, as well. Though the soilless, super-high-tech greenhouse is heavily regulated by sophisticated computer systems, its main source of energy -- the sun -- still governs operations more than anything else. Once again, it comes down to the delicate quality of those salad greens. Adam Garcia, a greenhouse assistant who recently started working at both of Gotham Greens’ Brooklyn locations, reports for duty between 7 and 7:20am each morning. Formerly a farmer on a typical on-the-ground farm in rural California, Garcia notes that his work schedule here in NYC is much the same as the one he maintained out west. There’s one big difference in his new line of work, though -- no messy soil to deal with. 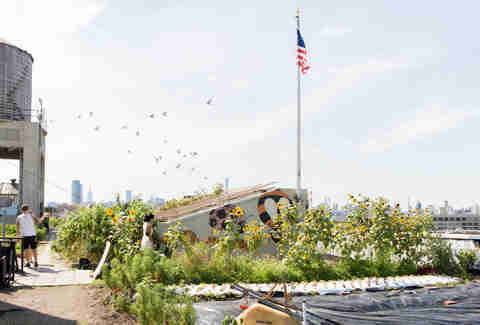 Plenty of other cities across the country -- Portland, Oregon; Detroit; and Chicago -- also foster plenty of urban farming initiatives, but as Annie Novak, co-founder of the Eagle Street Rooftop Farm in Greenpoint, explains, New York City is particularly primed for the urban agriculture movement, as it has long boasted a strong commitment to green spaces. “New York City has always had a very vibrant community of urban gardeners, it’s always had a lot of food justice organizations, there was a strong CSA movement, there were youth markets and green markets; I think the biggest shift was probably just looking upward,” she says of the move toward rooftop gardening. While comparatively small at just 6,000sqft, Eagle Street has found a strong community of supporters in Greenpoint, where it set up shop in 2009 atop Broadway Stages, a sound stage company. 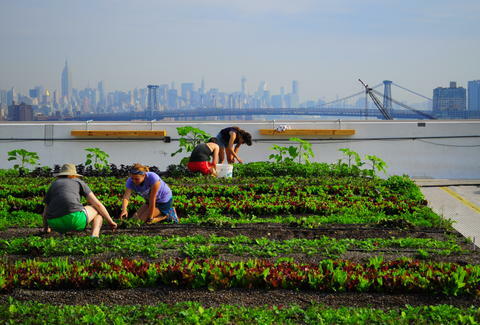 Offering sweeping views of the East River and Manhattan skyline, the farm grows more than 30 types of produce, including cucumbers, hot and sweet peppers, salad greens, peas, and carrots, and supplies its customers via a CSA as well as a seasonal market. Nearby pizzeria Paulie Gee’s and Williamsburg’s Marlow & Sons are among it restaurant clients. A hands-on farmer with years of experience in both rural and urban farming, Novak doesn’t see a divide between the two; rather, she sees both approaches as belonging to a continuum. New York City farmers tend to agree that agriculture within city limits has its challenges. While eaters’ interest in local food has never been stronger, city farmers and gardeners don’t always get as much love from government and property owners. All the hard work that goes into starting farms and gardens doesn’t necessarily guarantee their longevity -- if better options for the city, or building owners, should come along. In spite of the formidable obstacles to urban agriculture, city farmers are hopeful about its future. And making their efforts last beyond their own personal tradition at the farm is what keeps the farmers I spoke with invested in their work. Plakias, like the other farmers I spoke with, observes that while farm visitors and shoppers tend to be way more informed about urban agriculture than in the past, their level of delight and surprise at what they see hasn’t diminished in the slightest. In conjunction with the farm, Annie Novak of Eagle Street runs an apprenticeship program that, to date, has graduated more than 100 trained urban farmers. She says she’s noticed that would-be apprentices are coming to the program better prepared than ever -- even before they start. As the general public takes to city-raised food, and as opportunities expand for the people who grow that food, urban farmers are hopeful about the impact of urban agriculture on one set of New Yorkers in particular: kids. For children who are more familiar with shrink-wrapped iceberg lettuce from the supermarket than with soft, freshly grown romaine, seeing city farming in action can be a particularly revelatory experience. Lauren Rothman is a Brooklyn-based food and drinks writer with a soft spot for bourbon, doughnuts, and bourbon-glazed doughnuts. Check out her collection of food snapshots -- and cat pics -- on Instagram at @laurenoliviarothman.